In Driven to Distraction, Drs. Hallowell and Ratey revealed why millions of adults and children are chronic underachievers, caught up in persistent problems in school, at work, and at home. The cause is not lack of self-discipline, but, rather, an inborn neurological condition, Attention Deficit Disorder, or ADD. 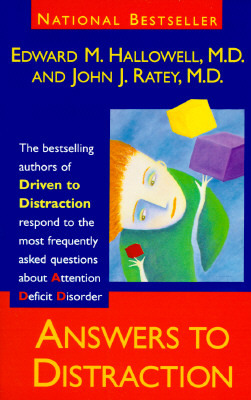 Answers To Distraction provides practical solutions to the dilemmas of ADD. This "user's guide" to ADD is presented in question-and-answer format ideal for even the most distractible reader. Each chapter covers a specific aspect of ADD, such as ADD in women, ADD and aggression, ADD and addiction, or ADD and work. The authors provide advice for teachers on recognizing ADD and helping students to cope, plus extraordinary insights into the relationship difficulties caused by ADD.